I received a letter this morning. It suggests that our Honda 'Cog' ad still has the power to fascinate and is perhaps now capturing the imagination of kids not even born at the time it was originally aired. 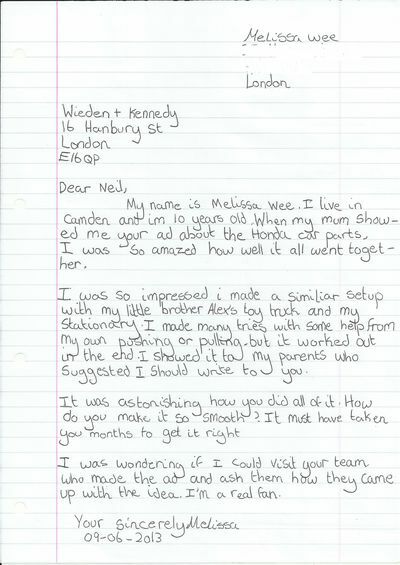 I can't help thinking that a visit to our office will be a bit of a disappointment for Melissa – it's just like a normal office only more untidy – but it's a very good letter for a ten year old. Neat handwriting and only a couple of errors. Perhaps there's a future for her as a copywriter. Update: AdWeek covered this story "10-Year-Old Writes Love Letter to Wieden + Kennedy About 10-Year-Old Honda 'Cog' Ad – The spot that keeps on giving" and said, "A commercial that inspires a love letter from a child a decade after it was made—that is special advertising." And there was a nice comment posted on the Adweek site in response to the story. The only thing that surprises me about this letter is how quickly it was delivered. Well done Royal Mail. That and her appropriate use of the word astonishing. Not many 10 year olds go that big with their vocab. The letter was scanned and delivered via email. What was your response to her? And did she come down to the office? That’s awesome 🙂 Foot in the door already, good start for her copywriting career (if she doesn’t change her mind by the time she’s old enough). Thanks for the reply and have a lovely morning/afternoon/evening!